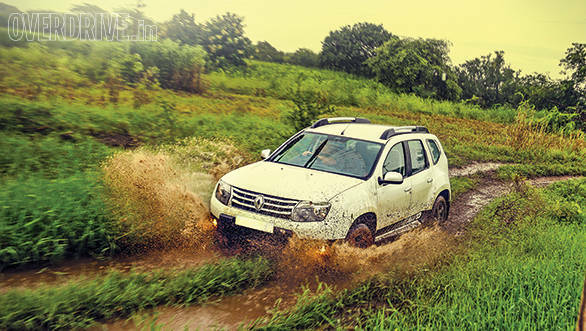 Any opportunity to roll in the mud with a 4x4 is always welcome and so we again grab the car keys and scour the outskirts of Pune in search for the ultimate dirty playground. Our toy is. of course. the new Renault Duster AWD that's been spruced up with some new interiors, headlamps, all independent suspension and of course the new all-wheel-drive system. The gum boots are on, let's sling some mud. I quite liked the muscular look of the Duster and thankfully in the AWD version not much has changed. 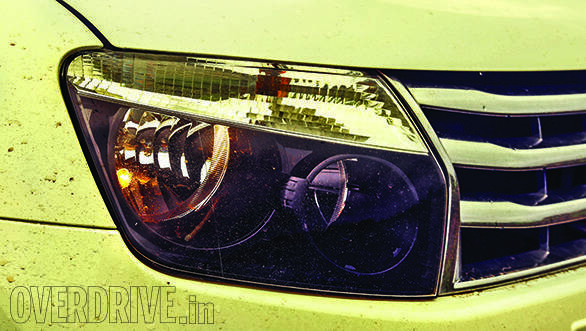 The headlamps now get a smoked black look and there's a proud 4WD badge on the boot. 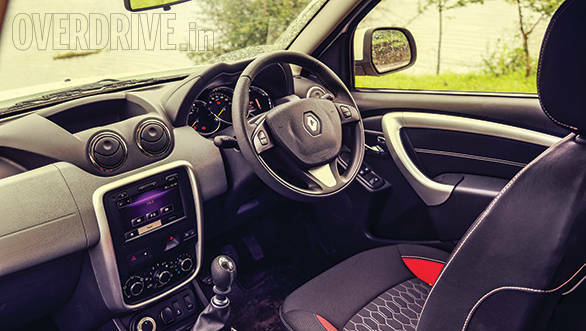 The interiors of the Duster AWD have been spruced up and are similar to the Adventure limited edition that was recently launched. There's a new three-pot instrument cluster that now gives you a real time efficiency figure. The steering is a less bulky looking unit with steering mounted controls for cruise control and to scroll through the menus. The stalk-mounted 'hidden' audio control unit has also been slightly redesigned but its intuitive functionality, that I loved is still the same. With so many new launches being face lifts these days it's nice to be talking about changes under the hood and in this case under the chassis as well. 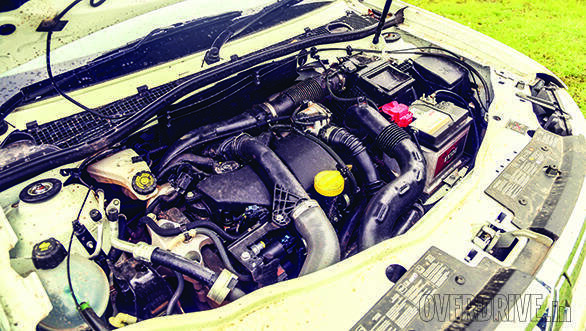 While the Duster AWD still uses the 1.5-litre K9K 110PS turbodiesel engine as it's FWD cousin, the gear ratios have been shortened to allow for better drive. Peak torque now comes in at just 1750rpm, 500rpm lower than before, and it does make a difference. First gear is now low enough that starting off in second gear is no problem on flat roads, it's even a suggestion in the owner's manual. This makes up for not having a low ratio gearbox and also means that the car is noticeably easier to drive through traffic than before. The all-wheel-drive system features an intelligent drive system or iDrive that allows you to shift between three modes (FWD, Auto and Lock) on the fly. It also features ESP (Electronic Stability Program) and ASR (Anti Skid Resistance) to keep you pointed in the right direction all the time. And these systems with the front wheel biased all-wheel-drive system really does keep the car straight in the slush and despite our best efforts to hang the tail out, we just couldn't. The old torsion beam rear suspension has been swapped for a neat independent setup that further improves the already great ride quality with the trade off being slightly increased body roll through corners. The sharp kickback from the steering through turns has considerably mellowed and with the new shorter gear ratios the 110PS motor and transmission is a much tamer beast in town. It still retains its secure, comfortable mile munching ability when out on the highway. The Duster completed the sprint to 100kmph in just a little over 13 seconds and despite the extra weight of the new shiny bits it's less than half a second slower than the front wheel driven SUV. We had very wet conditions on our test and so weren't able to complete a top-speed run but we estimate that the top-speed with the lower ratios will be slightly lower than the two wheel- drive 110PS version. In our fuel runs it showed marginally lower figures than the FWD model though Renault are claiming slightly better efficiency for this SUV. We managed to find some really nice slushy roads around a friend's farm and we pushed the Duster as far as we could. We were determined to find the limits of its abilities and eventually we managed to beach it on some very soft mud on a freshly ploughed field, needing a tractor to pull us out. And, truth be told, that deep mud would probably have caught out any 4x4. That's not to say it's as adventurous as something like the Gurkha or Thar but is certainly has a much larger playing field than the regular Duster. We found that the auto mode was more than adequate for most of our mucking about leaving the electronics to send drive to all four wheels when needed. We rarely found the need to switch to the lock mode. What's really fun, though, was finding a nice muddy track and giving it full gas. Then the fun really started as the steel bash plate and independent suspension soaked up everything we could throw at it. Two years ago this was the model we wanted to play with and now that it's here we feel that it certainly does expand the reach of the Duster while packing in some welcome surprises too. It's now better in town and through traffic and still just as accomplished out on the highway. Its off-road abilities may not be akin to climbing over boulders and rocks in rivers, chasing after a Gurkha but it will handle the worst mud, slush or sand you could throw at it. 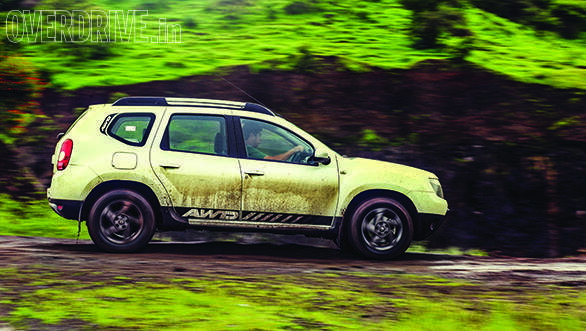 And that's the kicker for us, the Duster AWD is now a very capable off-roader that doubles up as an excellent everyday car as well and I want one.